A simple red gift bow casts a shadow on a white background. A gift bow can transform a simple gift into something truly special. 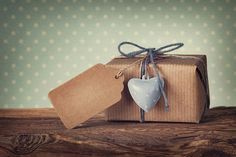 Place a bow in a contrasting color on a gift-wrapped box, or place a bow on an unwrapped gift to make it more festive. A stack of vintage gift catalogs sits on a wooden table, waiting to be read by interested parties. Many consumers order products over the Internet, but that hasn't stopped the manufacture of gift catalogs. A heart-shaped box of chocolates and two glasses of amber-colored beverage sit outside a gift basket laden with roses and wine. Perfume is housed in a small, crystal bottle, then attached to a chain that will allow it to be worn around a woman's neck. Perfume necklaces are a unique gift, and allow a woman to always have her favorite scent close at hand. This special, hand-crocheted blanket was made from white yarn with a bit of green trim for accent. Pink ribbons adorn the corners and set off the lacy edges. Some expectant mother will surely appreciate this baby shower gift! A delectable assortment of chocolate candies overflows from a linen-lined picnic basket. Combined together, chocolate-covered nuts, truffles, jellybeans, and other delicious goodies make for a wonderful gift. Visit Pinterest for more gift images.